Each household uses approximately 45 gallons of hot water each day, which means that a good portion of the energy bill goes towards heating up water. Many households would save a lot of money in the long run by improving the energy efficiency of their hot water tanks in the following ways. To control the temperature of the water, the water tank is controlled by a thermostat. Something as simple as lowering the set temperature can make a huge difference to the overall energy efficiency. For example, by reducing the thermostat temperature by 20 degrees Fahrenheit, households can reduce their overall energy usage by anywhere from 6 to 10 percent. To prevent bacteria, like Legionnaires, from growing in hot water tanks, most heating experts in Montgomery County recommend setting the temperature to at least 140 degrees. Heat dissipates. This causes energy loss, and makes the hot water tanks less energy efficient. A simple way to improve the energy efficiency of a hot water tank is to simply insulate it with open-cell foam insulation or even rigid insulation panels. Both will prevent heat from dissipating. Insulate the plumbing for more effective results. Inefficient showerheads and faucets can lead to excessive hot water use. Homeowners should consider replacing older showerheads with newer models, and to fix leaking faucets as soon as possible. Difficult repairs may require help from professional heating repairmen in Chester County. Improving the energy efficiency of hot water tanks is not difficult. In fact, there are many additional simple and easy fixes. 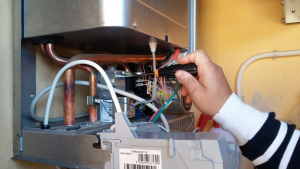 Those who are constantly running into inefficient hot water tanks or high energy bills may need to consider whether the tank needs to be replaced instead of getting repaired by professional heating contractors in Delaware.